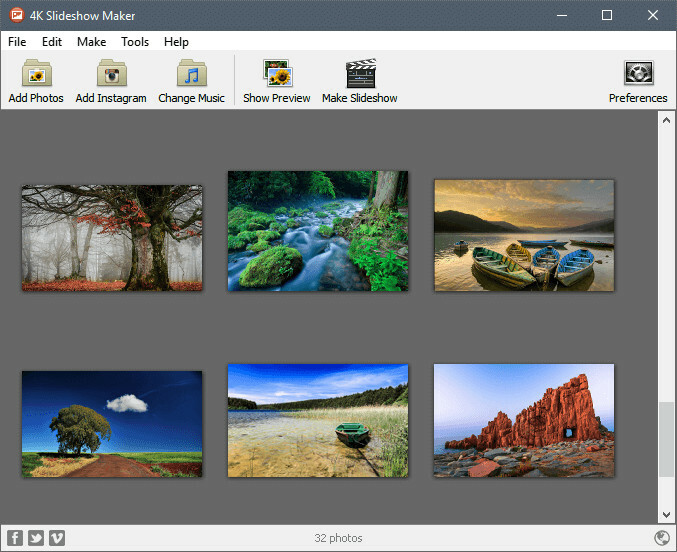 4K Slideshow Maker is an extremely easy-to-use app to create slideshows. Just add your favourite photos from Instagram or from your own computer, select the music and then apply gorgeous effects and transitions. Get started for free! If you want to create beautiful slideshows for school presentation or as a gift for special someone, you can do it within a few clicks with 4K Slideshow Maker. Advanced face-recognition technology insures that you won't miss that special someone. Click ‘Share on Facebook’ or ‘Share on YouTube’ to show your creation to the world! Save slideshows in 1080p, 720p or Ultra 4K HD quality to enjoy the high definition on your HD TV or online. Add images not only from your computer - import them directly from any public Instagram account and your friends’ private profiles. Select video output format – Windows Standard, macOS Standard, iPhone 5/4/3GS, iPad/iPad Mini wth Retina, YouTube, Facebook.